In some places this action was very rapid and sand covered and then preserved the remains. After heavy storms and at very low tides, peat or the stumps of these forest trees may be seen at places along the Welsh coast, particularly, in Pembrokeshire, at Newgale and Freshwater West. The remains of animals and Mesolithic tools have been found in these deposits. These include an Auroch, which is an ancient cow and is the ancestor of all modern cows, a pig, a roe deer, a red deer antler and a brown bear jaw. At Lydstep Haven, a pair of broken flint microliths were found by the neck vertebrae of a pig. This pig may have been injured, but not caught by its Mesolithic hunters and subsequently died in the forest. A tree trunk fell on its remains, preserving it, and the microliths in situ. This find has been dated to about 6000 BC. Geraldus Cambrensis (Gerald of Wales ) noted the uncovered submerged forest, during his tour of Wales in AD 1188. We cannot be sure whether the marks he saw were made by a stone axe. It is certainly possible, since stone axes were in use before the forests were submerged between about 6000 and 5000 BC. This is what the beautiful coastline looks like today…. At around this time I get an invitation from my friend Arlene, who lives in Edinburgh (quite a long way north of where I live as it happens) to accompany her on an evening at Stirling Castle, hosted by none other than J K Rowling (I’m sure I don’t need to tell you who she is) and Warner Bros (the film people who made all the Harry Potter films) for a charity event to raise money for the Multiple Sclerosis Society and the Maggie’s Cancer Care Centres in Scotland. Arlene has done a huge amount of incredible work over the years to help people and to help charities and she had worked really hard to help make this event happen. The castle was to be transformed into Harry Potters school Hogwarts for a Halloween charity ball and there’d be loads of special guests and magic and food and drink and stuff. Well how could I refuse? So I thought that I’d kill two birds with one stone, attend the exciting charity event with one of my best friends, and buy myself a new, superdy duperdy, expensive acoustic guitar in one of Edinburgh’s finest music stores. Now I know you want to hear all about what happened when I went to buy the guitar but I suppose I’d better tell you about the Harry Potter charity ball as well? It was pretty amazing. They did transform the castle into Hogwarts (wasted on me a bit, at the time I hadn’t read the book or seen the film, I know, I know, shocking) and we were greeted on arrival by witches, wizards and magicians, some breathing fire, while the music was supplied by pipers and flute players. My super friend Arlene introduced me to J K Rowling (they’re friends you know) but because I’m a plonker I didn’t realise who she was at the time (she’s not introduced to people as “JK” obviously), which I suppose was lucky because I didn’t get nervous, and I definitely would have done had I known. And, just like Hogwarts, burning torches decorated the castle’s Great Hall, where a four-course dinner was served, before a charity auction was hosted by Ian Hislop (Stephen Fry couldn’t make it apparently). Thankfully the auction raised tonnes of cash for the charities and I got a little overwhelmed by the size of the bids, amazed at how much money some people have got, but at least they were spending it on the right things that night, which was good. I also got a bit drunk. Anyway as it happens I had quite a bit of cash left over for the evening despite my best efforts to spend it all the day before on an expensive new guitar. I visited loads of music shops and tried the most expensive guitars they had, but I couldn’t get past this little cheap, relatively poor quality runt of a guitar that I’d tried quite early on because I liked the look of it, and when I played it, even though the action was terrible, I fell in love with its tone and sound quality. I desperately wanted to ignore it and find one that was at least 3 times the price, but I just couldn’t find a truly expensive guitar that I liked as much. And so, after exhausting myself with the whole sorry episode, I bought the cheap runty acoustic guitar and resigned myself to being useless at proper shopping. So I took it home and, after straightening the neck and improving the action, absolutely loved it. The tone inspired me to start composing music for the first time in my life, another incredible revelation which I’ll write about someday, and I kept composing until, many years later (and that’s another story), I released my first album played exclusively on that guitar – “Time Stands Still”. Despite my harsh words, the guitar is actually a very lovely maple wood Art & Lutherie from Canada and although it was cheap, I do love it. And so what did I learn from this (apart from the fact that Halloween parties in Scottish castles made to look like Hogwarts are ace)? The best things aren’t necessarily the most expensive, or best looking, or most well made, they can be the things that we connect with and love on a level that we may not understand but are lucky enough to recognise when they come our way. And so I’m grateful to my friend Arlene and to Harry Potter for inadvertently helping me to learn a valuable lesson and setting me off on a road I had no idea I was about to go down, but am so happy that I did. Here’s one of the first tunes I ever wrote on this guitar…if you want you can buy it from the link above, it’s only 79p or 99 cents! I have been lucky enough to be able to devote most of my working life to learning about nature and wildlife, and then learning about how best to look after it. Of course the old adage is really true here, the more you learn the more you realise how much you don’t know. But if you’ll allow me to put that to one side for a moment, one of the most surprising things that I have learned is that, contrary to what people might think, looking after (or conserving) nature is less about spending your time studying and managing wildlife and much more to do with spending your time dealing with people. If you don’t have the ability to communicate with people, then your ability to conserve wildlife is seriously diminished. This is because in most places in the world, people own or have a claim to the land that your wildlife is trying to share, and if those people don’t care about the wildlife, then they are unlikely to let you conserve it, particularly if there is no economic reason for them to do so. More often than not, if you can convince people that the land they have is precious, and the wildlife living there is of intrinsic value, then you’ve got a reasonable chance of getting them to care. What was it Leopold said? “When we see land as a community to which we belong, we may begin to use it with love and respect”. Well that’s kind of the sentiment that you’re trying to foster, and of course there are a lot of people who already feel that way, so it isn’t always an uphill struggle. One of my more recent jobs was to write a management plan for a beautiful farm in the Snowdonia National Park in North Wales which had been acquired by the National Trust, with the help of 20,000 donations from the public and weighty celebrity backing in the form of Welsh Hollywood star Catherine Zeta Jones. The National Trust have the job of conserving places like this in perpetuity, and having a management plan is an important tool in that process. “There are some places that, when you walk into them for the first time, you know are special, places that make you pause in wonder, places that most of us rarely come across in our day to day lives. Llyndy Isaf is one of these. It isn’t that Llyndy Isaf is more special than anywhere in the surrounding landscape. The farm lies within Nant Gwynant, which is one of the most dramatic and beautiful valleys in Wales. Its northern slopes rise to the summit of our highest mountain, Yr Wyddfa (Snowdon) and to the south are the relatively undisturbed hills of Moel y Dyniewyd and the Moelwynion range. The Afon Glaslyn river runs through two majestic lakes, Llyn Gwynant and Llyn Dinas, and below the picturesque village of Beddgelert, it tumbles down to sea-level through the positively alpine Aberglaslyn Pass. This is a world-class landscape and is at the very heart of the Snowdonia National Park. Ask any two people what they think is special about Llyndy Isaf and they will give similar but varying answers, “specialness” is very much in the eye of the beholder. Natural beauty is one term that can be used to describe much of it, and as we shall see as we gather our thoughts on how this place should be cared for in the future, the features that comprise natural beauty are many and varied. One feeling that dawns on a person at Llyndy Isaf is that this is a very old place. The valleys, hills, streams and lake all feel like they have been around for a very long time, and the rocks from which they have been carved, much, much longer. Even some of the trees are gnarled and twisted by many years of growth in rain, wind, cold and, from time to time, luxurious warmth. And yet there is much that is youthful. The feathery growth of new young trees, the first spring flowers of dog violet and bluebell tentatively raising their heads through the cold, wet, moss clad ground. This is an unusual place of great antiquity and brand new life. The unmistakable influence of human endeavour, the farm buildings, the sheep folds and pens, the field boundary walls and fences speak of hundreds, if not thousands of years of toil to provide food and shelter for countless generations of people. Many of these features of the landscape are regarded as our heritage, and it has been, and continues to be, the way people interact with that heritage that defines our culture. To the untrained or uninitiated eye this place looks wild, wonderful and natural. Well it is wild and wonderful, but it isn’t natural. This, above all else, is a cultural landscape. The rich array of habitats, the woodlands, grasslands and heathlands are as much cultural landscape features as are the buildings and walls. Like anywhere else, Wales’s landscapes have emerged from people’s interaction with natural resources under changing environmental and economic conditions through time. This continues. But while the character and form of these areas can be explained, it is much harder to predict how they will change in the future. If we apply international definitions of wilderness, there are no wilderness areas in Wales, and there is no potential for such areas. The common misconception of wilderness relates to people’s sense of exposure to the natural elements and absence of built development, not to wild untouched places. When people understand the history of human settlements, agriculture, forestry and water management, the human influence becomes obvious everywhere. In its place, we have a glorious living landscape, the wildlife of which has been shaped over thousands of years as the mainly unintentional by-product of generations of people toiling to provide a living for their families. These activities have also left us with a landscape covered in wonderful historic buildings and monuments. This is our cultural landscape and it is special and precious; its values should be celebrated and not diminished through comparison with something that happens elsewhere. The land at Llyndy Isaf is a magnificent example of this, and now it falls to the National Trust to take responsibility, on behalf of so many people who helped to purchase the farm, for how this place is to be cared for into the future”. The photographs show what a beautiful place it is, and so inspiration for music was plentiful. This song was inspired by the magic of nature and also by the writings of Aldo Leopold, who proposed the “Round River” metaphor for life’s energy from the ground, through plants and animals and back into the ground in a never ending circle. Quite a long time ago I fulfilled a long held dream and traveled all across the USA in an old Buick Skylark with a friend of mine. We traveled 11,000 miles and visited more states, National Parks, cities, state parks and rest areas than you can shake a stick at (a favourite saying from the trip that, being from England, we’d never heard before and it made us giggle). For me it was an unforgettable experience, as I traveled to places with names that had held a deep fascination for me since I was a young boy, Oregon, Wyoming, Montana, Arizona, California, Nebraska (the list goes on, sorry not mention them all, no offence intended to residents of Connecticut and elsewhere). My fascination started watching western films as a kid. I couldn’t believe the incredible wide open spaces and big skies, the beautiful forests and deserts and mountain ranges, with their amazing wildlife – bears for goodness sake! We get excited if we see a squirrel (and most of them are from N. America and not native to the UK at all, but that’s another story). And as I grew older I started reading more and more about this wondrous land. I read the Lewis and Clark journals. What an incredible story of an expedition sent out by President Thomas Jefferson to see what lay beyond the great Mississippi River, because back then few people knew, it was literally the wild west. And what did they find? They found an incredibly rich land roamed by enormous herds of buffalo, native people in numerous tribes, wolves, bears, forests and prairie, incredible. Imagine climbing up a ridge and finding yourself looking down upon the geysers and steaming hot springs of Yellowstone, a primordial landscape? In fact the whole landscape was on a par, if not better than, the great plains of Africa for all round natural splendour, and it was still largely intact only 150 years ago. Then I read Bury My Heart at Wounded Knee by Dee Brown. What a heart breaking but deeply fascinating account of the history of Native Americans in the American West in the late nineteenth century. He describes the people’s displacement through forced relocations and years of warfare waged by the United States Federal Government. Much later I read two books by Kent Nerburn, Neither Wolf Nor Dog and The Wolf at Twilight which explored the story of the American Indians in a much more intimate and real, and ultimately far more complex way. Both books beautifully written and compelling, I’d recommend them to anyone. So you see I’ve got quite an interest in the American landscape. If you add in the influence of the great North American nature writers such as Rick Bass, Doug Peacock, Edward Abbey, David Rains Wallace and of course the greats, Aldo Leopold, Thoreau and John Muir (ok he was Scottish), then that interest has developed into a passion. Of course I listened to a lot of music, I’ve been doing that since I was 3. Of all the many musicians that were able to speak to me about the American lands through their music (and not their words), Pat Metheny stood out for me. In particular his album with Charlie Haden, Beyond the Missouri Sky was a sublime interpretation of an open, prairie like landscape of big skies, huge fields of wheat and corn, and small farms. That album showed me that you can paint quite specific pictures with simple music, you don’t need an orchestra, as so many of the great film soundtracks have got. Of course Pat Metheny is a genius and can make his guitar say pretty much anything he wants it to. And Charlie Haden is a master of the understated, delivering warm, folky bass lines focusing on purity of tone and texture. His Oklahoma roots can be heard in the playing of a double bass, now that is a mark of great musicianship. Later when I heard the album that Charlie Haden made with Hank Jones the penny dropped. They released an album called Steal Away: Spirituals, Hymns and Folk Songs which is a soft, gentle masterpiece and the title tells you all you need to know about the style of the music. Here we had a simple blend of what I’d call ‘woody, blocky’ piano reminiscent of old churches and school rooms, and bass that sounded beautiful to me. Finally I read John Steinbeck’s Travels with Charley and when I finished I thought how good it would be to write a similar account of my travels, before realising that I ain’t no author. And then it hit me, why not write songs about it instead? So I started to work with piano, double bass, guitar and drums, and became totally immersed in the whole project as it began to unfold. The more I worked, the more the songs and melodies would come to me. It was as if they had been stored up just waiting to be released, which in a sense I suppose they had. What resulted is something that I am very proud of because it was such a challenge to compose, arrange and perform the music so that, at times, it sounded like a four piece folk/jazz band. It wasn’t easy to play all of those instruments to the standard that I required so that, hopefully, the listener would be able to hear the emotion and the depth of each composition, and most importantly, feel the wide open space and atmosphere of the landscapes. I guess it’s for others ultimately to decide how successful you have been as a writer and performer of the music, but all you can ever do is be honest with yourself and ask, did I do that with all my heart and to the best of my ability at that time? My answer is yes, and that’s all that really matters. This song is about the destruction of the great buffalo herds of North America in the late 1800’s, which coincided with the final demise of the last remaining native Indian tribes at that time. 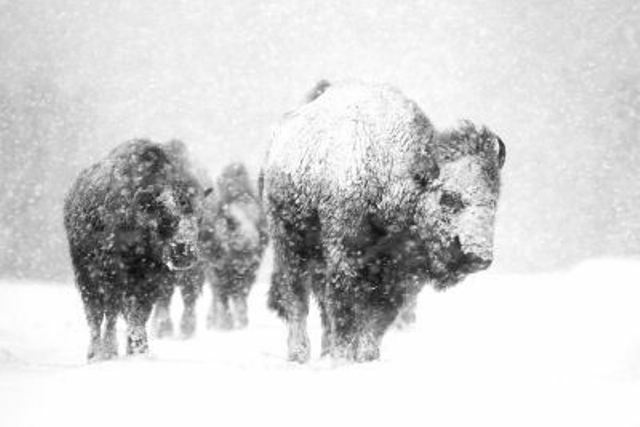 Like them, a very small remnant of the original buffalo population survived in Yellowstone National Park, and they are still there to this day. The song is on my new album “Heading West” released on January 15th 2013. The album grew out of reflections on an epic journey I once took across the North American continent. Occasionally it’s good to give oneself up to a particular landscape in your experience, to wonder upon it, to dwell upon it and to listen to the people who made their mark on it. It isn’t simply the sublime thrill of moving through magnificent plains, mountain ranges, valleys and cities. It could be the sigh of the wind through juniper trees, or the little shadow which runs across the grass and loses itself in the sunset, or the smell of an old wooden church on a quiet street. Distinctive music often defines cultures that have emerged from such a landscape, and so drawing on folk, gospel and jazz influences, the songs on Heading West are reflections and dreams from my journey.